I wanted the space to be functional, but girly, but not too over the top, and I think we found a great balance. Growing up I was a pretty big tom boy for a while and my mom always told me that one day I'd have a daughter and would want to be super girly with her, and she was right. I've said it a million times, but it really is attack of the pink in this room, and I'm really not even mad about it. Also, let's just talk about the wall decor and that flower pillow for a moment shall we? 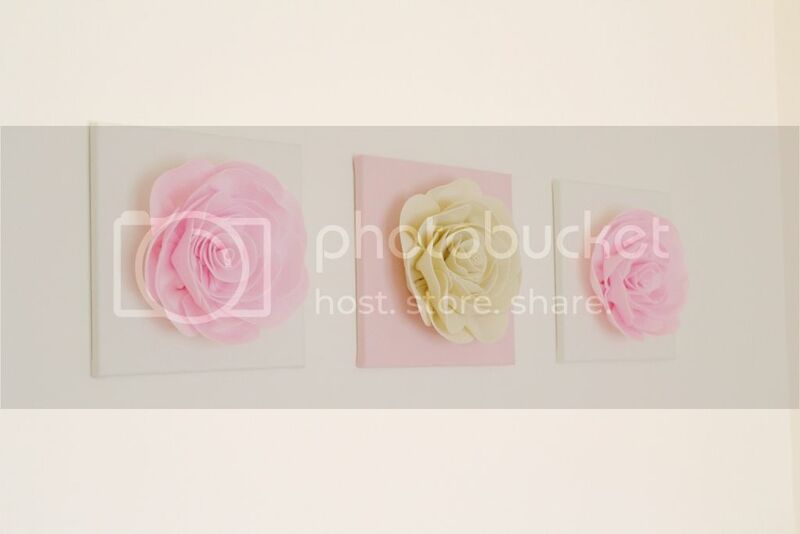 They're from my favorite home decor Etsy shop, BegBuggs Boutique. Derek's brother Jacob, and his wife Krista own the shop, and they're amazing. BedBugss is their full time gig and I'm always super amazed at all the things they've been able to do with their business. Their story is pretty incredible and amazing, but Krista tells it a lot better than me, so you can read all about that here. Once we got settled into our house I ordered these wall canvasses in a heartbeat and I don't regret it one bit. They do an awesome job of filling the space above her crib, and seeing them everyday when I walk in there makes me so happy. We did get slightly spoiled when we ordered because my sister-in-law did throw in that pillow as a surprise for her new little niece, and that pillow seriously makes me a little giddy too. It was the perfect finishing piece for the room. Those flowers were cut and sewn by hand. Amazing right? 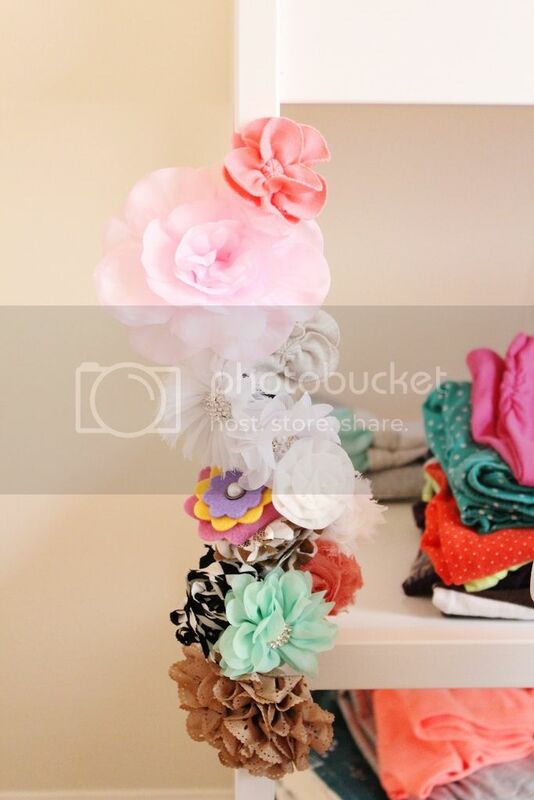 We didn't have anything to display all her hair bows so we looped them around the leg of the changing table, and they instantly became decor, and are all easily accessible! This is so cute! 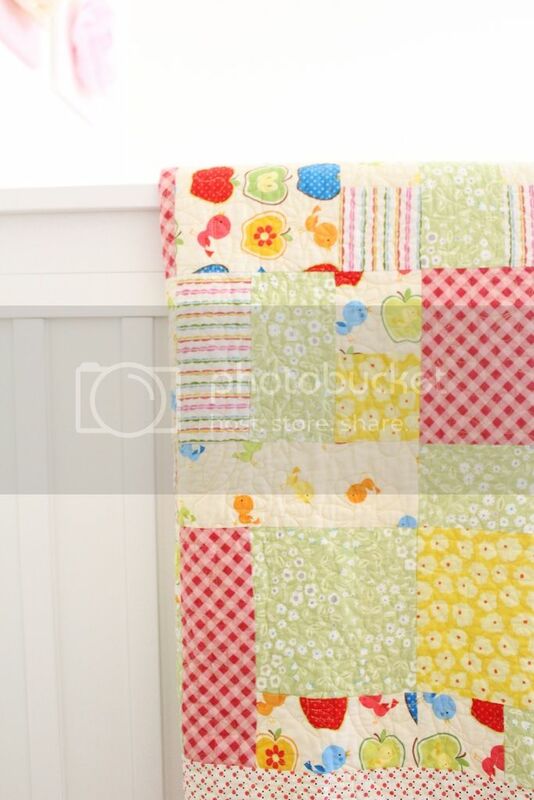 I just love a cute nursery with calming colors and personal touches! 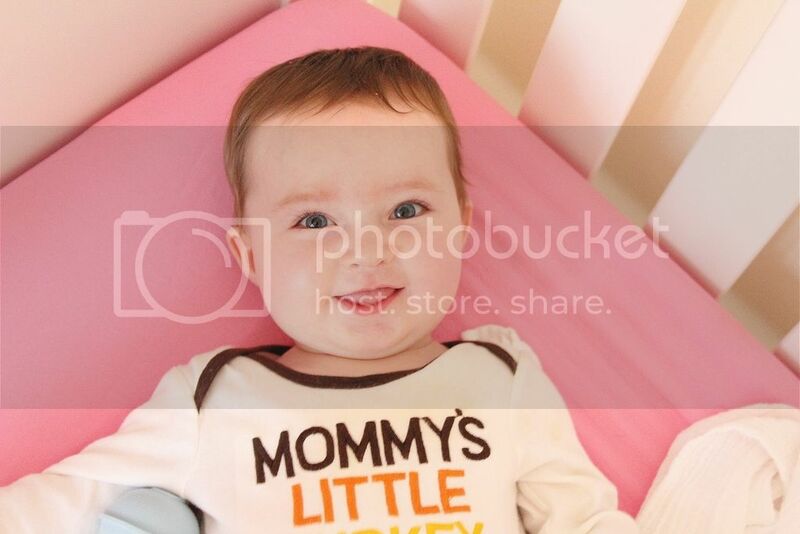 Our little girl's is Gray and white with pink accents and other splashes of character.. It's so fun! Love it. 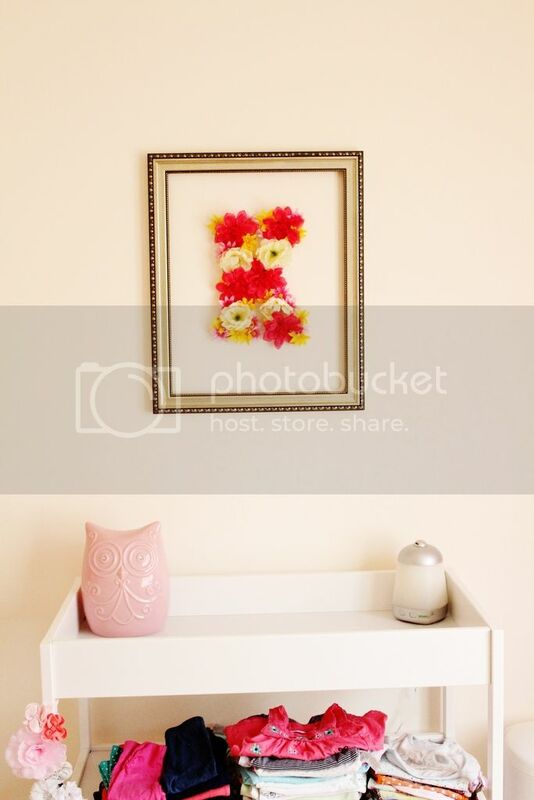 I love the 3-D flower canvas over the bed! It's really girly and soft! 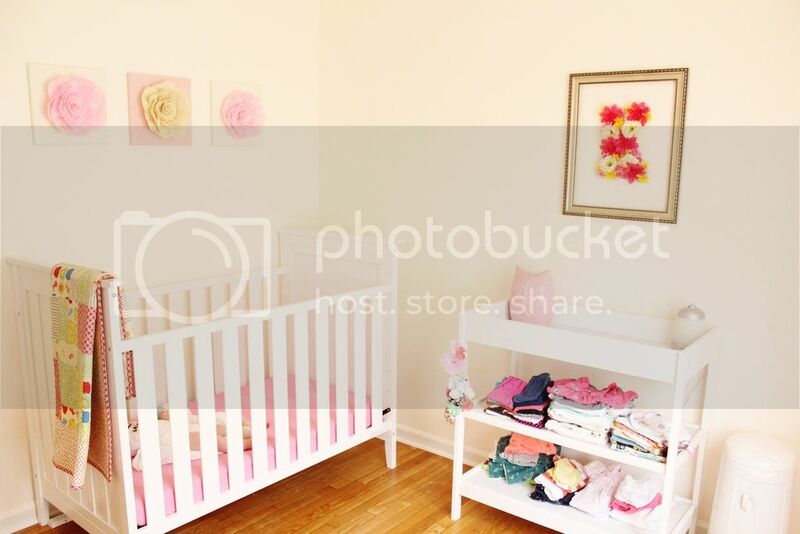 Lovely nursery space... I like the floral touches throughout!! So cute! I love all of the flowers! Such a sweet little room! I especially love the framed letter made from flowers! Too cute! Your room is so pretty! I love the Roses on the pillow and on the wall! 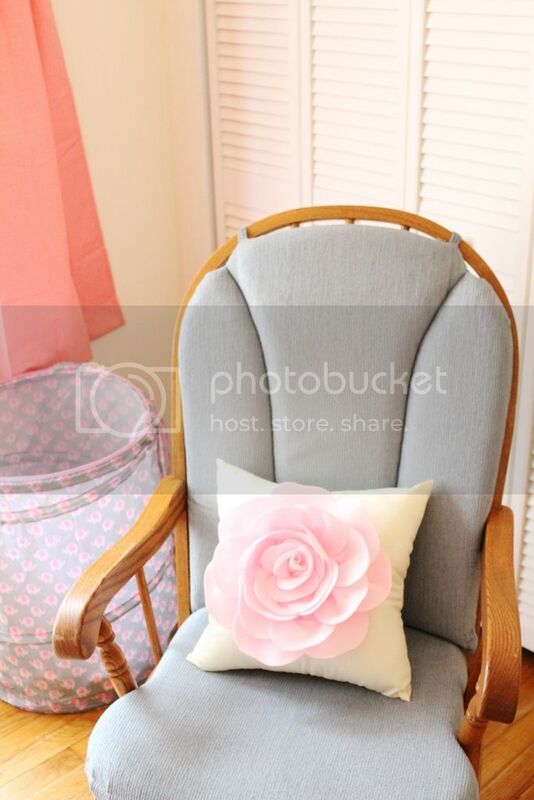 What a soft pretty room for your baby! You did a good job.